Let the tropical sea breeze take away all your worries! Mo Sheng and Yi Chen are back from Hong Kong! She complains that she is tired and he immediately offers to do the “cleanup” work <3. Just as she leaves, he pulls out a blue box and you guessed it! It’s the ring! Xiao Hong tells Mo Sheng that everyone at work now knows about her marriage. While most people are super happy for Mo Sheng, Yi Jing is really upset that she has been tricked this whole time since she was trying to interview Yi Chen again and again. Yi Jing pulls out a resignation and tells Mo Sheng to pass it on for her. Yi Chen notices that Mo Sheng is a bit down, and Mo Sheng lets him know about Yi Jing’s situation. She is also tasked with making up with Yi Jing by the boss lady. Yi Chen tells her that he will take care it, and he jokes maybe Yi Jing can pick between Xiang Heng or Lawyer Yuan? Yi Chen gives Yi Jing a call and apparently things are taken care of right away. Mo Sheng wants to know what he did but he tells her it’s professional secret and walks away. Mo Sheng follows up with Yi Jing and Yi Jing confirms that she will return to work. And indeed she does come back to work and Mo Sheng sends Yi Chen a message to thank him. Ying Hui is at some art exhibit commenting on how Mo Sheng’s pictures are just like her, full of sunshine. He continues to say he made a lot of mistakes in the past, and he was too confident. Just then, Yi Chen arrives. Ying Hui tells him that he had always wanted to put on an exhibit for Mo Sheng. Ying Hui introduces Mo Sheng’s first paid commission when they (husband and wife) reunited in California, and she took him out to dinner. The man goes on to point out another picture and some other cheesy memory. He wonders why Yi Chen doesn’t comment and Yi Chen says he didn’t want to interrupt someone reliving their past. Ying Hui tells Yi Chen that these pictures are not the past, but that another is. 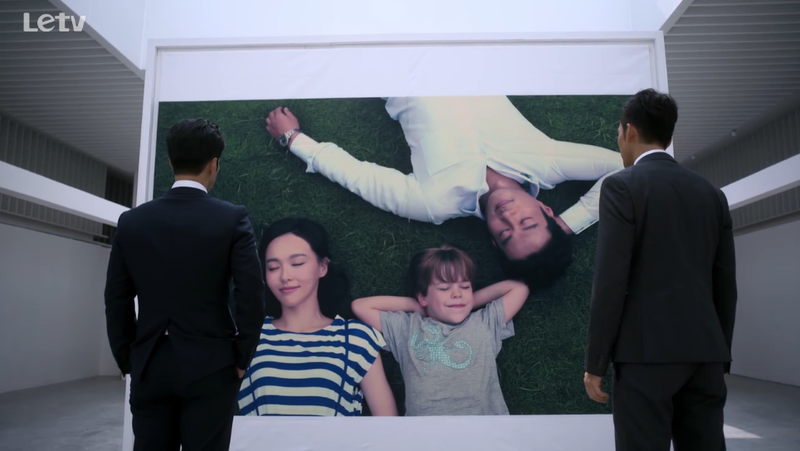 He brings Yi Chen to giant picture of himself with Mo Sheng and Xiao Jia. He calls Yi Chen out for being a homewrecker and then informs Yi Chen that the divorce has not gone through so their marriage is still in effect. Yi Chen questions the validity of it all and Ying Hui tells him to go ahead and look into it himself. Back at home, Yi Chen asks Mo Sheng about her time in the States. She starts to recall all the details and he’s like not that much details. He asked a couple of legal questions and she responds positively to all of them except one: she and Ying Hui did not go to the Chinese embassy to report their marriage. He asks her about her divorce and the court papers. She says she has it and she received the papers in about a month of time. Yi Chen asks her to give him the papers soon and he tells her to sign a document for him which allows him permission to take care of her pictures’ copyrights. Yi Chen: You aren’t going to read the contents? What if I sold you off? Mo Sheng: Even if I didn’t sign it, if you want to sell me off, you can do so anyway right? This is the danger of marrying a lawyer, right? The next day, Yi Chen dumps his work on Lawyer Yuan and Xiang Heng in favor of taking Mo Sheng on a honeymoon, much to Lawyer Yuan’s surprise and horror. Yi Chen waits for Mo Sheng to get out of work and tells her they are going to Hong Kong to take a flight to Mauritius. Mo Sheng: I didn’t bring my passport. Yi Chen: I have it. Mo Sheng: We didn’t eat yet. Yi Chen: Eat on the plane. And so the two of them arrive in Mauritius with like one tiny suitcase, and Yi Chen is still in his suit and tie. Mo Sheng thinks to herself that this speed is not like going on a honeymoon, but more like eloping! Meanwhile, Ying Hui receives a lawsuit from Yi Chen, suing him for copyright invasion. He then has Linda give Yi Mei a call to confirm an interview. Yi Mei sends Yuan Feng a message to thank him. Xiao Xiao sees it and the two of them get into an argument again. Oh these two, just admit you love each other already! Anyway, let us go back to the tropical island! Mo Sheng and Yi Chen go to their enormous hotel. Mo Sheng notices that there is only one bed, and Yi Chen asks if she minds. Mo Sheng says no, but then she goes to the bathroom and totally freaks out. Yi Mei visits Ying Hui and bombards him with all these super crazy and fancy compliments in hopes that he will let her interview him. He still declines so she brings up the fact that he was recently interviewed by Treasure so why can’t she interview him because the TV station is way more professional and well known. Ying Hui tells her he is not here to listen to her berate someone else. Yay Ying Hui for once! But he is not nice for too long as he lets out that he accepted the magazine’s interview because his wife works there. He makes up some stupid lie about how “Mrs. Ying” had an argument with him and so she came back to China. Yi Mei puts two and two together and figures out that he is talking about Mo Sheng. Ying Hui, you are the lowest of the lows, seriously! I can’t believe you are using all these tricks and schemes to get Mo Sheng at all cost. So completely cheap! Meanwhile, at the sunshine paradise, the two lovebirds are enjoying a lovely day at the beach. Yi Chen looks on as Mo Sheng plays with some kids in the waters. He suddenly remembers the story of the child Ying Hui brought up at the exhibit. playing with the kids. hey is that the xiao jia actor? ?